I remember my first pair of designer jeans really well. This was back in high school, and I couldn’t have been more excited to walk into one of the coolest boutiques in Arizona to try them on. They had signature stitching across the back pockets, a worn-in wash, and straight-leg cut—and I’d never felt better slipping on a pair of jeans. I can’t remember the exact price, but it was enough to make my Dad scratch his head and wonder why I had just paid good money for jeans that were purposely distressed and looked like they’d already been worn. But I wore those jeans until they were threadbare and certainly got my money’s worth. And as a huge fan of jeans, I was constantly on the hunt for cool new pairs of designer denim for the years that followed. It’s funny though because lately my designer jeans have been sitting in a neatly folded pile at the top of my closet—completely untouched. Instead, more affordable denim has been in constant rotation in my wardrobe. Unworn are my skinny jeans with high-tech stretch. Replacing them have been more rigid, high-rise jeans in vintage washes like Levi’s 501s. While today these might seem like a throwback to the ’90s, Levi’s iconic 501 style has been around since 1890 and is still a classic today. Now, I don’t have anything against designer denim—quite the opposite. But it’s been interesting to discover that well-made jeans are available at any price, and sometimes the less expensive options can end up being your favorites. Classics are classics for a reason and deserve a place in your wardrobe. Read on to see how I'm styling affordable denim and shop for jeans under $100. Wear your light wash Levi's with sandals in the summer and with chic booties in the fall. Style light-wash jeans with a basic tee and tassel earrings. A vintage-inspired denim is a must-have for this summer. Add a chic belt to accessorize your outfit. Complement cropped denim with strappy sandals. Wear a silk blouse to balance the distressed denim. It girls like Bella Hadid style their Levi's with old-school sneakers. Cuff your jeans to balance out the high-waisted cut. For a minimalist look, style your jeans with a plain white tee and sandals. Style darker-wash denim with loafers and a blazer for the office. An unfinished hem adds a fashion-forward detail to your jeans. 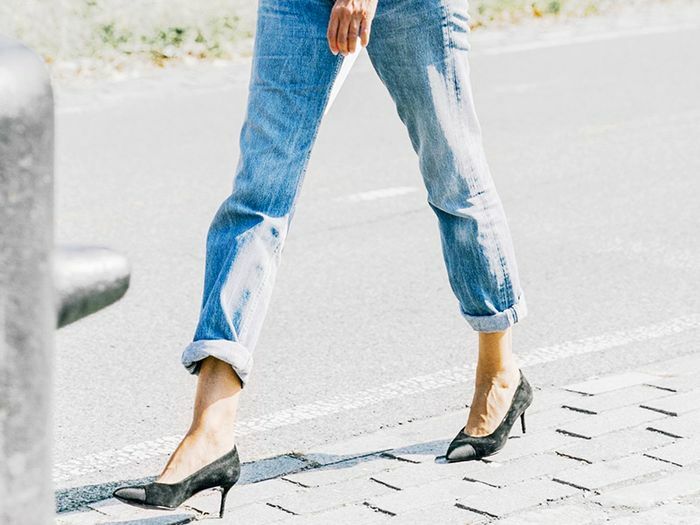 When wearing skinny jeans, wear a pointed toe to elongate your legs. Wear a fitted top to balance out baggier vintage jeans. We'll say it now and say it again—Levi's are summer's It denim. Wear your staple denim with a bomber jacket and loafers. With refurbished denim, don't hesitate to get your jeans tailored for the perfect fit. Pair these with retro jewelry. A basic pair of denim is a staple piece for many occasions. Tuck in an oversize blouse into high-waisted denim. Next, read about the cool dresses French girls always wear.